Ancient History | What's in a Journey. Ancient History. I’m a sucker for the really old stuff. Of particular interest to me with this trip is the history of the Hittites, whose empire was strong between the 18th-12th century BCE. The Hittes are mentioned in the Bible, supposedly Abraham purchased a cave from them, though it’s possible that the writers of the Biblical story of Abraham borrowed the name “Hittite” from their current history as it’s debatable that there were Hittites in Canaan during the time of Abraham. Regardless, it is true that the Hittites and the Egyptians had a lot of dealings with one another back in the day and there’s a ton of history that comes from their conflicts/relations. For example, the very first known Peace Treaty in the history of the world was written between the Egypitans and the Hittites. Luckily for me, it’s in Istanbul at the Archaeology Museum, so I’ll get to see it there! I’m pretty excited about the museum in Istanbul, but it looks like there is a museum that has an even larger collection of Hittite artifacts in Ankara, Turkey’s capital. I’m thinking about the possibility of stopping at the Museum of Anatolian Civilizations on my way to Cappadoccia. Maybe just one or two days in Ankara? Certainly it sounds like it would be a good introduction before going to Cappadoccia, which was a major settlement of the Hittites. 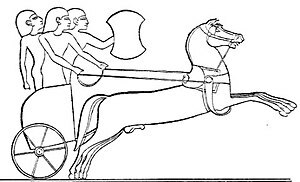 A random piece of history for you: The Hittites were well known for being charioteers. In fact, they were very likely the first to utilize charriots during war! They utilized their mechanical skills to improve the charriot and made it possible to carry 3 people as opposed to only 2. ← Oh the Things I’ll do!